Flow through the 2 ½” Hose Monsters with built-in pitot. Uses the Monster Tester for remote flow readings from a single gauge. 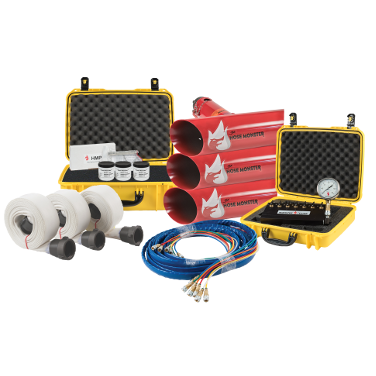 Bundles are our recommended set-ups for Fire Pump Testing and Hydrant Flow Testing. Actual equipment needed may vary depending on intended use and preferences. Each component is sold as a separate line item and can be substituted. Contact us to determine the configuration best suited for your operation. How many hose streams do I need? 2 Hose Streams can test a 750 GPM Rated Pump. 3 Hose Streams can test a 1000 GPM Rated Pump. 4 Hose Streams can test a 1500 GPM Rated Pump. 6 Hose Streams can test a 2000 GPM Rated Pump. 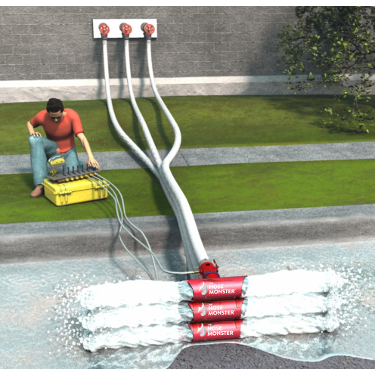 8 Hose Streams can test a 3000 GPM Rated Pump. 12 Hose Streams can test a 4000 GPM Rated Pump. Larger Pumps may require additional hose streams.